Since “Sherlock Holmes and the Body Snatchers” came out last March, I’ve been diligently working on the last installment of the Whitechapel Vampire Trilogy, as yet unnamed, and have at last completed a rough first draft. A few editorial notes about the trilogy. 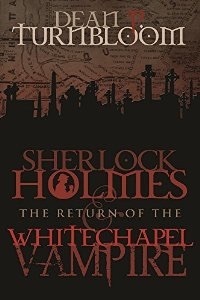 The first book, “Sherlock Holmes and the Whitechapel Vampire” was written entirely in third person point of view (POV) and I took my fair share of criticism for that as it was not in the Watson first person POV of most of the canon. That didn’t bother, though, as the original concept for the book wasn’t a Sherlock Holmes story, but was conceived as ‘what if Jack the Ripper were really a vampire’. Because of the time period involved, I worked Sherlock Holmes into the story, at first as an ancillary character. But I enjoyed writing the Holmes parts so much, I beefed up his role, which caused me to consider first person, but thought I’d wait. The second book, ‘Body Snatchers’ was written in first person POV, but from varying characters. I thought it served the story and I was hesitant to attempt a full pastiche by having Watson’s POV be the only one in the book. But now, in the third and final installment I’ve decided to go all out and write it as Doyle might have. The final book of the trilogy follows Watson throughout and will, I hope, give the reader more than a few surprises along the way. This final book takes place many years after the first two, which took place in 1888, first in London, and then New York. The action in the third takes place again in New York but in the year 1913, long after Holmes has retired to beekeeping in Sussex. So, this trilogy has several arcs for the reader to follow. The story arc spans some twenty-five years, from 1888 to 1913, and each character in the story, I think, has his or her own arc of change. Finally, the writing itself has an arc from third person POV to multiple first person POV and finally to the first person POV used most often by Doyle, that of Watson. My hope is that aficionados of writing and of Sherlock Holmes will take note and enjoy the varied styles and mostly will enjoy the story from beginning to end. I thought it would be fun to solicit ideas for what the reader would like to see in it. If you should happen by this blog, do stop a moment and comment…particularly if you’ve read my first novel.